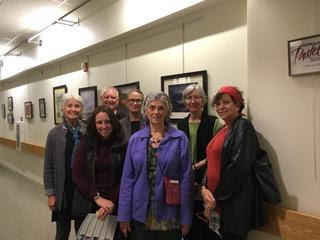 The Vermont Pastel Society mission statement calls for us to build and strengthen connections among pastelists, to foster artistic development, and to promote public appreciation of pastels as a fine art medium. With those goals in mind, we took the membership roster, divided it up geographically, and assigned each member to an area called a Regional Hub. We found that our membership naturally clustered into six areas; each region elected a regional point person or point people to help the Regional Hub plan for and facilitate activities. Our goal is to provide our member artists with the richest experience possible, by facilitating member involvement and participation in, among other things, local art-related happenings, networking opportunities, and assisting with transportation of paintings. A Regional Hub is intended to be for the members and by the members under the provisions and guidelines that the VPS state organization functions. Said a different way, Regional Hubs are local extensions of the VPS state organization made up of pastel artists residing relatively close to one another. A member artist can contact the Director of Hubs (Judy Albright – judyalbright@snet.net) or the VPS Membership Secretary (Maggie Smith – mffsmith@gmail.com) to find out what Regional Hub they’re in and to find out who their Regional Hub point person is. The members of each Regional Hub will decide what types of activities and events they would like to organize. It is a VPS policy that hub events be open to the entire VPS membership whenever feasible. An event is considered open–feasible for the entire VPS membership–when there is room to accommodate more than the interested artists in the host Regional Hub. If the hub event is deemed open, it is to be announced in advance of the event in Hub Happenings. If space doesn’t allow, then it is closed to the VPS as a whole. Regional Hub meetings, which happen once a year, on the other hand, are only for Regional Hub members. Regional Hub point people regularly email the Director of Hubs with a brief report of their hub activity, and the Director of Hubs communicates this to the entire VPS membership through Hub Happenings in order for other Hubs to learn what one hub has done and perhaps to take that on as well. Pastel artists who are not yet members of the VPS but who are interested in the Regional Hub experience are encouraged to contact the Regional Hub point person nearest to them and arrange to attend the next hub activity or event.